We are a family orientated artlure fishing club based in Pretoria. 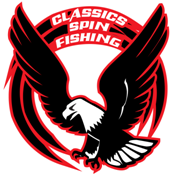 Our logo, the African Fish Eagle, is related to the North American Bald Eagle and is fairly large and is very well known for its distinctive call. Classics have a very comfortable atmosphere and welcome all new members by sharing knowledge with new members and making them feel at home. We have seven club competitions during the angling year. Some of the club competitions coincide with league competitions. We have a meeting after each competition where the results of the competitions are announced. At the club meeting we decide where our next club competition will be held. We have a Christmas function every year towards the beginning of December where all members and their families come together and enjoy the day together. We also have an annual prize giving towards June where trophies and certificates are handed out. The club is a strong supporter of catch and release of fish. The club is more than 30 years old and was formed on the 29 November 1977 during its first official general meeting. During the years we produced some very fine anglers, with a number who received provincial and national colours. These include juniors that participate in the junior leagues.